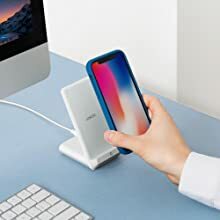 Anker Powerwave 7.5 Fast Wireless Charging Stand with Internal Cooling Fan, Qi-Certified, 7.5W Compatible iPhone XR/XS Max/XS/X/8/Plus, 10W Charges Galaxy S9/S8+ (with Quick Charge Adapter). 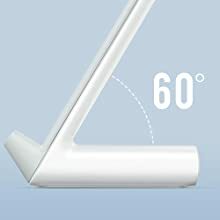 Flip It: Charge in landscape orientation while watching videos, or portrait mode for messaging and Face ID. Case Friendly: Don’t fumble with your phone case. PowerWave transmits charging power directly through even heavy-protection cases. 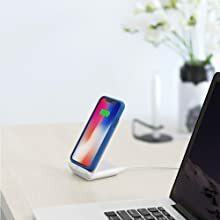 What You Get: PowerWave 7.5 Stand, Quick Charge 3.0 AC adapter, PowerLine 6ft Micro USB cable, welcome guide, worry-free 18-month warranty, and friendly customer service. Experience one of the most convenient ways to charge—ever. Just set your device down and let the power flow. With advanced device-detection technology and a state-of-the-art internal cooling system, the PowerWave series sets the benchmark for wireless charging. An expanded charging surface, adaptive technology, and advanced safety systems combine to create PowerWave, the premiere wireless charger from Anker. Advanced technology detects your wireless charge-compatible devices, delivering up to 7.5W for Apple devices, and 10W for Samsung. A state-of-the-art internal cooling fan prevents overheating and slowdown, maintaining high-speed charging from 0% to full. A highly-efficient chipset and premium components ensure a reliable, high-speed charge, every time. 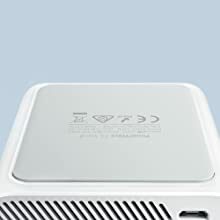 Intelligent technology determines battery status and administers only the appropriate voltage, keeping your phone safe no matter how many times you charge. Premium TPU coating prevents slipping and sliding. Optimized for comfort viewing and iPhone’s Face ID. The Anker Advantage: Join the 10 million+ powered by our leading technology. High Capacity: Weighs as little as a can of soup (13.3 oz) yet charges the iPhone 6 five times, the Galaxy S6 four times or the iPad Air almost one and a half times. Safely recharges with a 2 amp output charger (most phone chargers have 1 amp output). High-Speed-Charging Technology: PowerIQ and VoltageBoost combine to deliver the fastest possible charge up to 2.4 amps per port or 4.8 amps overall. Input: 5V / 2A. Incredibly Durable: Built with a double-layer shell and fire-resistant polycarbonate to ensure rugged resistance to impacts, vibration and extreme temperatures (-40°F to 158°F). The Anker Advantage: Join the 20 million+ powered by America's leading USB charging brand. Charge Faster: Qualcomm Quick Charge 3.0 (24W) with Anker's proprietary PowerIQ and VoltageBoost technology deliver the fastest possible charge to almost any USB device. 7 Days of Power: 20, 000mAh is enough charging power to fill iPhone 7 almost seven times, Galaxy S8 more than four times and iPad Air 2 one and a half times. 6-Hour Recharge: With Quick Charge input, a full recharge is over in half the time of standard portable chargers (wall charger not included). Premium Portable Charger, High Capacity 26800mAh External Battery with Qualcomm Quick Charge 3.0 (in- and output).